Minnesota will outlaw smoking in bars, restaurants and other establishments starting Oct. 1, 2007. Gov. 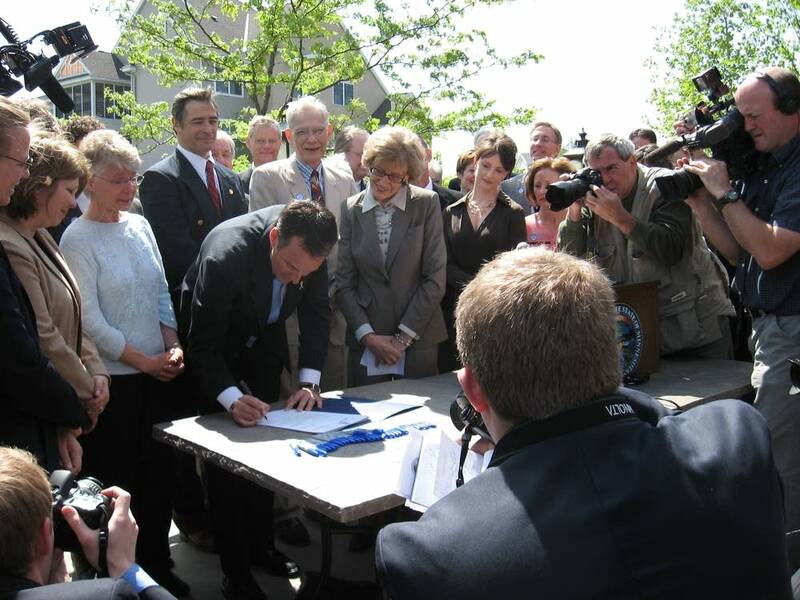 Pawlenty was surrounded by dozens of supporters of the smoking ban as he signed the bill into law Wednesday morning outside an Eagan restaurant. "This is a proud and good day for Minnesota to reclaim its proper place in being at the forefront of discouraging smoking and promoting public health," said Pawlenty. "And to have this available to our citizens is a very positive step forward." Pawlenty downplayed concerns that the smoking ban will keep customers away, saying on balance bars and restaurants will likely see sales increases. He also said protecting the public's health trumps the private property argument opponents of the ban have voiced. Naysayers were nowhere to be found at Granite City Food & Brewery, a clean, modern restaurant where smoking will still be allowed at the bar for another four and a half months. CEO Steve Wagenheim said dealing with various smoking regulations at the chain's 18 Midwestern locations is a headache, and most customers are happy to eat in a smoke-free environment. "This county-by-county smoking ban was ridiculous," Wagenheim said. The president of the Minnesota Medical Association, Dr. G. Richard Geier, said in a statement that the ban was the most important step for public health in more than 30 years. But Jim Farrell, head of the Minnesota Licensed Beverage Association, said health advocates went overboard and will end up putting some bars out of business, particularly in counties poised to adopt or implement strict outdoor smoking regulations. "It went from being about health to just being mean and sticking it to bars," Farrell said. Outdoor smoking is still permitted under the statewide smoking ban, unless local ordinances restrict it. Smoking is also allowed in private homes and vehicles, hotel and motel rooms, truck cabs, farm vehicles and buildings, locked psychiatric wards, tobacco shops, Indian ceremonies and on stage for actors performing in plays. Violations will carry fines of up to $300 for smokers and proprietors who knowingly allow smoking at their establishments. Most of the enforcement will fall to proprietors, who will be required to ask patrons to stop smoking and ask them to leave if they don't. Local governments are still free to pass stricter anti-smoking ordinances.